The COSMANIACs agree! Everyone wants a radiant, smooth skin ... and the organic beauty brand ILIA ensures that EVERYONE can create this with the new True Skin Serum Foundation. The latest True Skin Serum Foundation from ILIA is a godsend! The True Skin Serum Foundation is a special skin care and complexion-correcting foundation on a serum basis. What does this mean? Very simple... with the True Skin Serum Foundation you create the perfect, natural-looking, uniform, radiant skin. True Skin Serum Foundation is a complexion-perfecting, serum-infused foundation that’s equal parts skincare and color correction. Weightlessly delivers buildable medium coverage with a silky finish while at the same time nourishes with a powerful blend of botanical actives that leaves skin looking like skin. Aloe leaf, rose hip, jojoba and marula oils soothe irritations tame redness, plump fine lines, and ensure the formula effortlessly melts into skin for a more even, luminous appearance. Blurs imperfections and minimizes pores for a complexion that looks refined and refreshed. The True Skin Serum Foundation is available in 10 shades, ranging from very light to dark skin. Your 'true match' will certainly be included! If you have doubts about which color best suits your complexion? You are of course always welcome in our store in Amsterdam (Herenstraat 19). One of our make-up artists will ensure that you leave the store with the perfectly matching color AND a radiant, smooth skin. Why is it that we are so enthusiastic about the new organic foundation? As true COSMANIACs we obviously could not wait to test the True Skin Serum Foundation! Quiera has the lightest skin and found Tavarua SF2 her true match. Texel SF3 is the ideal match for the wonderful skin of Marije and Isabella. Catalina SF7 gives our Charlotte a more 'flawless skin'. And if you just have his 'always' tanned skin as Laura, then Maraca SF9 is amazing. Besides all the different skin tones we all have different skin types and we all want a different coverage! Luckily, this is all possible with this organic foundation. 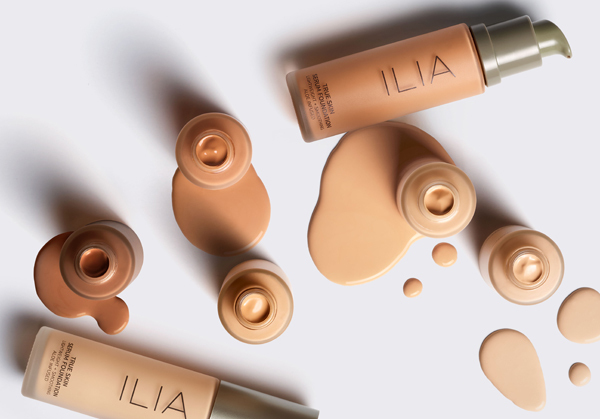 The structure of ILIA's True Skin Serum Foundation is thin and easy to build up to a medium coverage. Will you soon come and see our radiant skins at our store in Amsterdam?